We operate a telephone call-back appointment system at the surgery to improve patient care and reduce waiting times. The aim is to make sure that those who most need to see a doctor are given priority. Instead of booking an on the day appointment with a doctor, patients will request a telephone call-back. When the doctor phones back, you will discuss your reasons for wanting an appointment and decide jointly on the best course of action. Nurse appointments can still be booked in the usual way and you can still pre-book appointments for a later date, either face to face or over the telephone. This new system will help us to utilise our resources in the most efficient and appropriate way. We feel it will help to improve continuity of care between doctor and patient. The Patient Participation Group has been fully involved in the introduction of this system. I like seeing my doctor face to face. Why can’t I book an appointment? 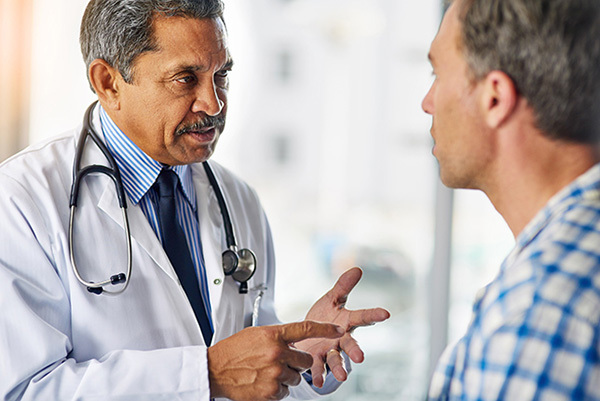 When you speak to your doctor you will discuss together what would be best and if you and the doctor agree that a face-to-face consultation is right the doctor will arrange that for you. Will I be told when the doctor will ring me back? What if I ask for a home visit from the doctor? Your call will still be added to the doctor’s telephone consultation list and the doctor will phone you back within one hour. Together you will be able to discuss the problem and the doctor will visit you if it is necessary. If you have any concerns while waiting for the call-back you should phone again. I understand the receptionist will ask me to explain briefly why I am ringing. I am not happy with this. It helps the doctor to have an explanation of why you are ringing. They can then prioritise their calls appropriately. It could be that the problem can be dealt with by someone else more quickly, for example a copy of a sick note or chasing a hospital referral. However, if you do not wish to provide an explanation that’s fine, just tell the receptionist. I am not very good at talking about my problems on the telephone. I would like to see someone in person. The receptionist can book you a telephone call-back with a doctor. When the doctor phones please say you would like to see the doctor face to face. Even at the end of a telephone call-back if you feel in any way unhappy and still wish to be seen please tell the doctor. Will I be able to ask for a call from my usual doctor? Yes, part of the reason for introducing this system is to promote continuity of care between doctor and patient. However if your usual doctor already has lots of calls that day you may be asked to phone on another day or be offered a call from a different doctor. All clinicians in the practice have access to your medical records and will have these in front of them when they call you. I have phoned the surgery and am waiting for a call-back, but I feel things are getting worse. What do I do? If you feel you are getting worse and still waiting for a call please phone us back. What if the doctor rings me back and I miss the call? If you miss a phone call the doctor will attempt to contact you three times in total. If you are concerned that the doctor has not rung please ring us back to check in case we have the wrong number. The doctor’s telephone number will show on your phone as a blocked/unknown number. Will the doctor ring me on my mobile if that is what I wish? If your voicemail message is personalised the doctor may leave a message if they have been unable to reach you. For automated or non-personalised voicemails this may not be appropriate as it runs the risk of compromising confidentiality. Please could you let the receptionists know if you are happy for us to leave messages. What if the doctor wants to see me in a few weeks’ time to review my condition? They will either book the appointment with you there and then or ask you to phone in at the requested interval. After the telephone consultation the doctor made me an appointment. Can I cancel it? Yes, if you need to cancel any appointment for whatever reason please let us know as soon as possible. We can then offer that appointment to another patient. If you want to book a different time this request will be passed on to the doctor. When you need an appointment with the practice nurse, you should advise the receptionist of the reason (eg, blood pressure check, diabetic review, etc) so that she can allocate the appropriate time for your appointment. For example, a blood pressure check usually takes 15 minutes, however, an interim diabetic review normally takes 20 minutes whilst a full review can take up to 30 minutes. We have a 24hr cancellation line using iPlato for mobile phone users. You can also contact the surgery during surgery hours on 020 8469 2880 and press option 1.